In this spectacular collection of panoramic images, award-winning photographer Macduff Everton collaborates with writer and artist Mary Heebner to capture a place of unending superlatives—Chile’s Last Hope Province. In this spectacular collection of panoramic images, award-winning photographer Macduff Everton proves why Chile’s Last Hope Province, in the extreme southern corner of Patagonia, is a landscape that kindles the dreams of world travelers. 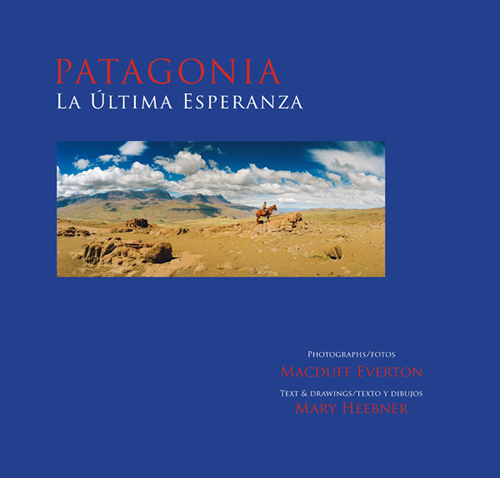 Patagonia, La Última Esperanza is a collaboration with writer and artist Mary Heebner, whose meditative prose reflects the poetry of place. Just as her observations seek to unearth and understand the spirit of the region, her paintings, watercolors, and drawings evocatively counterpoint Everton’s photographs of iconic mountains and glacier-lined fjords. Together they provide a unique perspective on this vast, still mysterious territory and the lives of the people who have made a home here at the tip of the South American continent. While visitors rush to the landmark peaks of UNESCO-designated Torres del Paine National Park or the wonders of Bernardo O’Higgins National Park, they too often miss equally gorgeous and accessible but less frequented areas. Everton and Heebner explore much more, from the shimmering ice fields and glassy lakes to the island mazes and expansive grasslands where you’re more likely to see condors than another person. They find the beauty and meaning in the fishermen’s harbors, the cowboys’ ranch labors, and the creations of visionary architects, whose stunning constructions mesh concern for the environment with the grandeur of the setting. 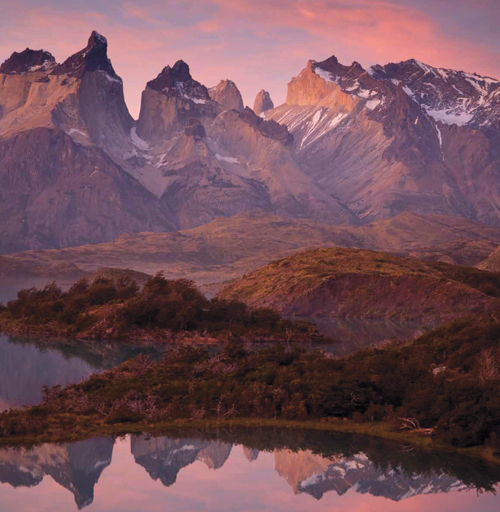 Patagonia, La Última Esperanza indelibly captures a place of unending superlatives—the most breathtaking mountain ranges, the most storied valleys, the most inspiring destination for readers and travelers alike. Everton and Heebner previously collaborated on The Western Horizon , in which her essays and watercolors complimented his photographs of the American West. Everton has work in the collections of many public and private institutions, including the Bibliothèque Nationale, Paris; International Center of Photography, New York; Los Angeles County Museum of Art; Musée de L’Elysée, Lausanne, Switzerland; Museo de Arte Moderno, Mexico City; Museum of Modern Art, New York; and Tokyo Fuji Art Museum. Heebner is a painter and book artist whose work is included in collections at the J. P. Getty Research Center, New York Public Library, San Francisco Museum of Modern Art, University of California, and Santa Barbara Museum of Art. Tucked below South America’s bulging left hip that contains Peru, Ecuador, and Colombia, Chile is geographically isolated from the rest of the continent by the longest mountain range in the world. The great earthen curtain of the Andean Cordillera, towering as high as 22,841 feet, was once a seabed that thrust skyward 80 million years ago. On the flip side of the Equator, Chile’s profile mirrors the Pacific corridor from Baja California to the Inside Passage stretching to Alaska. In Chile’s north, traces of the ancient Inca terraces are interred beneath the parched Atacama Desert, a place where rainfall is measured by the drop. The farther south one ventures, the more reminiscent Chile is of North America’s Northwest. The terrain thins out to a labyrinth of channels and islets, perforations in the icy blue lace of glacial waters in Patagonia and Tierra del Fuego. To picture Chile’s anorexic proportions, imagine that Chile’s length measures more than one tenth ofthe Earth’s circumference, yet it is only on average 106 miles wide. The entire 2,600-mile-long country shares the same time zone and an extraordinary social continuity, but its fifteen different regions describe distinct ecological areas of desert, lake, littoral, subantarctic, urban, and mountain environments. In the south, Patagonia is a varied land layered in legend and redolent with mystery. Its very name has become a metaphor for the wild and extreme. In 1520 Ferdinand Magellan and his crew, having successfully navigated a route from the Atlantic Ocean to the Pacific, brought back tales of a near-mythic race of naked humans. They imagined these creatures to personify the monster in Primaleon , a popular chivalric potboiler of the day, in which a knight rescues a princess from the grips of a huge, blood-smeared, meat-eating colossus called Pathagon. Thus, literature fueled Magellan’s imagination to name the region. It was just the first of many exaggerations and romantic notions associated with the area that continues to be known as Patagonia. This is a place well suited to legend. Situated at the ends of the earth, vast and mostly uninhabited, with limitless horizons, it is a land of lost boundaries. Some claim that its appellation should be restricted to the area where the indigenous tribes once lived. Others accept a broader definition—the entire tail of the continent—south from the Bío-Bío region of Chile and the Río Colorado region in Argentina. The Magallanes Region in Chile, containing South America’s tip, Tierra del Fuego, and Chilean Antarctica, includes the magnificent Provincia de Última Esperanza, The Province of Last Hope. In 1557 Captain Juan Ladrillero, coming from the Pacific, was searching for the strait that Ferdinand Magellan had discovered en route from the Atlantic. Trying one last time, Ladrillero sailed down a large fjord in the region, his “last hope,” but the passage dead-ended at a glacier. The somber name had the ring of hard-earned poetry and must have struck a chord oftruth. And so the place remained Last Hope, the name of the sound and later the provincial surroundings that encompass 21,407 square miles, an area larger than Switzerland. The Magallanes Region is the result of geologically recent glaciation; the land was revealed as the glaciers started retreating 12,000 years ago. When a wall of glaciers separating an enormous inland paleo-lake from the sea broke apart approximately 8,000 years ago, unleashing floodwaters that rearranged the landscape with apocalyptic alacrity, it was probably the cause of the extinction of the prehistoric American horse, saber-toothed tiger, giant guanaco, and Milodon sloth, whose remains were found at Milodón Cave. Only a few miles from the cave, paleo-indigenous groups—who predated the Precolumbian population encountered by Magellan—used red paint made from red lichen mixed with guanaco fat to leave markings of dots and streaks on the rock walls of an overhang above Laguna Sofía. Following the explorers and adventurers, European settlers arrived in Última Esperanza in the latter half of the nineteenth century, intending to raise sheep. They divided the land into ranches known as estancias. Many ofthe first colonists, primarily British and German, initially sought opportunity in Argentina, then moved to Última Esperanza for better pasture. Chileans from the island of Chiloé provided a strong labor force. But the impact on the nomadic Aonikenk and Kaweskar was profound: These indigenous people lost their hunting lands, which, along with disease and alcoholism, hastened their demise. In Tierra del Fuego Europeans paid bounties for their slaughter. Some Europeans profited, but many a settler’s life was hardscrabble, and while the colonists had immigrated to escape equally poor regions of Europe during a time of political and social turmoil, they, too, suffered from disease, fatigue, alcoholism, homesickness, and depression. In their own ways, both cultures lost their homelands. The Province of Last Hope has grown out of this conglomerate of hope, despair, and steely endurance. Today, most of the 20,000 inhabitants live in the capital of Puerto Natales. Ranchers raise cattle and sheep on estancias manned by baqueanos, who are similar to gauchos—but, whereas the gaucho works only on the pampas, the baqueano works in mountains and wetlands, as well as pampas, and possesses an empirical naturalist’s understanding of the region, its animals, plants, and elements. On the coast, fishermen ply the seas for hake (merluza,) congereel (congrio), king crab (centolla), and sea urchin (erizo), and work at the salmon farms. At the same time Última Esperanza Province has become a destination for world travelers. The province features fjords, islands, mountains, ice fields, lakes, and pampas and includes Bernardo O’Higgins National Park, Cueva del Milodón Natural Monument, and the UNESCO-designated Torres del Paine National Park. The provincial capital and only city in Última Esperanza Province, Puerto Natales was founded in 1911 to service the growing sheep-based economy. Four years later, the Sociedad Explotadora de Tierra del Fuego, the largest landowning organization in South America, opened a factory a few miles away at Puerto Bories to process the province’s meat, fat, wool, andhides for export to Europe. At capacity, the plant handled 300,000 sheep a year. A narrow-gauge railway on the wharf in front facilitated the loading of ships. Another railway transported workers to and from Puerto Natales. Today Natales is a picturesque miscellany of colored tin and wood buildings situated in a larger-than-life landscape, sheltered by the Sierra Dorotea mountain range and facing Last Hope Sound. The town square, Plaza de Armas, is ringed by the church, city hall, post office, government offices, and some of the best local restaurants. School kids in uniform gather in the park; small shops sell handcrafted caps, capes, sweaters, and jewelry; and the tradition of an after-lunch siesta is still strictly observed. The town goes quiet from 1 to 3 p.m., and even the street dogs, who are notably friendly, well-cared-for members of the community, curl up on stoops to take a nap. Tourism is an important industry here, as Puerto Natales is the gateway to Torres del Paine and Bernardo O’Higgins National Parks and a base for excursions throughout the province. The peak season is spring and summer, from November through March, when Natales swells with tourists, climbers, and backpackers. Over Christmas and New Year’s, the savory aroma of cordero al palo, lamb barbecue, suffuses the summertime air. An average of 4,000 lambs are sold each holiday. It is during the winter months that Natalinos reclaim their town. This is the time that work in village businesses and on the estancias slows significantly, and neighbors have time to get together—except for the fishermen, for it is peak season for king crab, and sea urchin, and the men are hard at sea.